Without clear communication, your employees won’t understand your mission, goals, and vision. Employees want to work toward something they believe in, so it’s important they understand and are working toward the same goals you are. Communication should also be consis-tent in establishing work expectations, giving constructive feedback, and in training new employees. With great communication, your employees will know exactly what they are working for, will rely on you, and will give their best effort for you. When things go wrong, employees look to you for the answers and judge the situation based upon your reaction. Even if the company is experiencing a major downturn, it’s important to always be confident, calm, and the best example you can be for your team. If you aren’t confident with the organization in a situation, then be confident in your own leadership skills. Your job is to maintain the happy work environment, and continue leading the team in their daily work. Whether you’re starting a new business, or you’re leading a team at an established business, it’s important to get employees invested in the vision and future of the company. You must be inspired and invested in the company in order to inspire others, like Larry Page and Sergey Brin, the founders of Google. The product of their inspiration has inspired millions across the world, and has significantly impacted the world we live in today. Though inspiration often looks forward to the future, it’s also important for the present; it gives employees a reason to work, succeed, and do their best in everything they do. Make them feel invested in the company through inspiration, and they’ll be loyal, hard-working employees. Regardless of the situation, always stay positive. Positivity is essential to productivity, employee happiness, and work environment. When mistakes are made, even if they are serious, it’s important to look at the bright side of things, though it would be easy to get upset and lash out. You are setting the tone for the work day, and your attitude directly affects those under your leadership. Bringing snacks, giving compliments, and even showing an interest in an employee’s personal life can have a significant impact on each and every workday. Although not a requirement, a sense of humor goes a long way in leadership. It helps create a positive work environment and enhances the feeling of camaraderie. For example, Warren Buffett once said ,“I buy expensive suits. They just look cheap on me.” Your unique personality and sense of humor shows your employees that you are more than a leader, and that you aren’t a machine, which encourages them to feel comfortable around you. Some decisions have to be made quickly, and can catch you by surprise. In times like these, it’s up to you to think outside the box to find a solution. Your team will be looking to you in this situation for guidance, so a quick decision must also be a good decision. Henry Ford faced a situation like this when demand for his vehicles was so high he couldn’t possibly keep up. Instead of making the obvious decision to hire more people, he thought with creativity and developed the assembly line. You may even brainstorm with your team to build upon some of your ideas. When your employees are involved in a decision or idea, they often feel more invested, respected, and important. When you are in a situation where creativity is necessary, your creativity level and experience can either gain your employees’ loyalty and respect, or damage it. Sometimes leaders are presented with situations that aren’t in the textbooks, and for which you might not be prepared. The first decision isn’t always the best one, and taking your time to come up with a unique solution can be in the best interest of your workers and organization. Sometimes, leaders have to draw upon their instincts, past experiences, and mentors for help in these complicated situations. 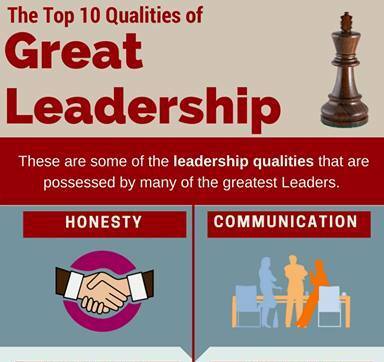 The road to leadership is a hard one at times, but these qualities will make the destination more rewarding and effective.